Tired of furnishing your home with the same old stuff? Want to surprise your kids with that toy they’ve been dreaming of? Wish your wardrobe made you feel like a million bucks? Then you’re in luck! The best buy and sell experience out there is now in a neighborhood near you. 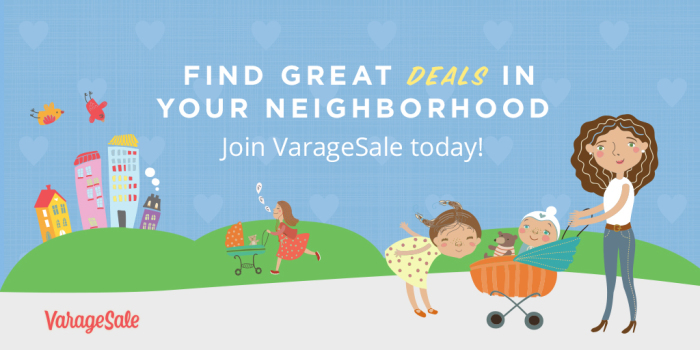 Created by a mom in 2012, VarageSale is the fun way to to find amazing deals on stuff you love. It’s also safe. View a seller’s profile before you meet so you know you’re dealing with a real person. The best part? It’s free to use and oh-so easy to use! But—wait for it—did you know VarageSale is launching in your neighbourhood? Sign up right away for exclusive access to a ton of great deals and (my sources tell me) a few “super cool surprises.” That’s right, to celebrate their new community, VarageSale is holding a 48 Hour Sale on May 5th… and you’re invited. Until then, start shopping!